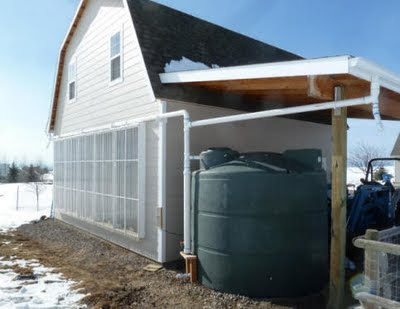 We just finished up a rain water collection system a couple weeks ago and now have the full construction details up on the site. The system uses the roof of my shop and carport (925 sf total) to collect rainwater into a 2500 gallon polyethylene container. We then use a small pump to pull water out of the container for watering the garden and trees. The new water collection system. 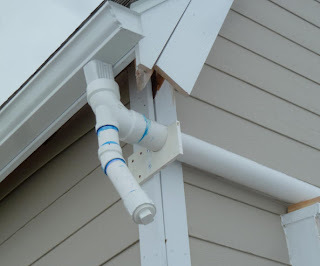 Building the system included adding gutters to the roof, running 3 inch PVC collection plumbing from the gutters to the tank, doing a first flow diverter, adding an overflow pipe, and working out a simple pump arrangment to get the water over to the garden. 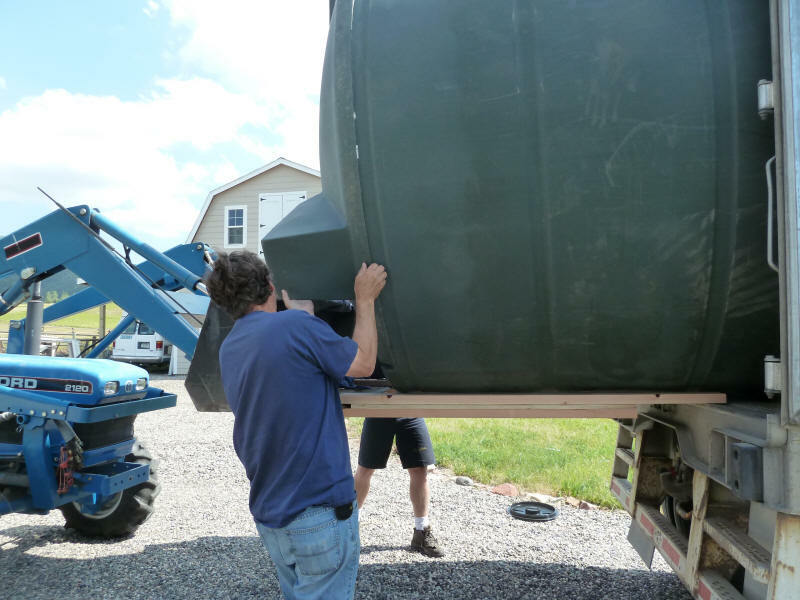 The writeup goes through the details on how we picked the tank size using the very handy CLIM20 weather summary (free from the gov). And then goes on to show all the details on placing the tank and putting in all the plumbing. All in all a pretty easy job. It looks like the system will provide about 7000 gallons a year depending on how our actual usage pattern works out. We are planning to use the water only for garden and tree watering. Of curse, it also provides some water for emergencies. We may do a larger system using the house roof later depending on how this works out. So, this system coupled with the switch over to all dual flush toilets is saving a lot of water use at our place. This is gettting to be more and more important in our valley. The one troubling aspect of all this is that we still use a lot of water to water the lawn through the summer. I don't even want to do the estimate on how much because I'm sure I won't like the number. I guess that the answer to this is to go to a more native plant, low water landscaping scheme -- anyone know any good resources for planning this kind of landscaping in the Rockies? By the way, I've added a new comment system for articles on Build It Solar, so it will be possible to easily comment on, ask questions, and discuss each article -- I encourage everyone to use this. The first article with the new comment system is Randy's attic, and the writeup on the new rain water harvest system is the 2nd. I think this is a great idea. I struggle with the setup of my current house, and how i can incorporate things that actually make sense. This is definitely one of those things. This and the attic article earlier, i am definitely going to try and work on. You're right about the lawn watering being the biggest consumer of your water. On annual basis here in Denver, the lawn will typically consume 60% of a family's water. Your lawn looks much bigger than a typical Denver lawn. This idea is simply wonderful. I have never thought of it before. I think I'll talk to my father about this and hope he'll consider such wonderful rainwater system. Although I am in S. Oregon and have a well, lawns are a pump expense if watered all summer. I have heard that zoysia (sp) grass is much more drought tolerant, but not sure of use in Montana. In Idaho and S. Oregon, sheep farmers are using Australian outback grass species, stays greener longer, more drought tolerant. But my friend just let's lawns go to "feral", using bark mulch, and native plants. But that is not friendly to grandkids. So I mow weekly and use canal water in my location. And chalk it up to a "play" field for my little ones.